To fix our schools, we’re looking at the wrong statistics. Instead of looking at test scores, we should be looking at the free breakfast and lunch program statistics. Today was the first day of my residency at an elementary school in New York State, and I noticed that there were many more children eating in the breakfast program than last year. I was told that the number of free-breakfast children had doubled since last year. It’s the economy, stupid! Let’s not delude ourselves: Good jobs, good health care, and good food will help students perform better in school. How can we expect teachers and their impoverished students to raise achievements while states slash social services? 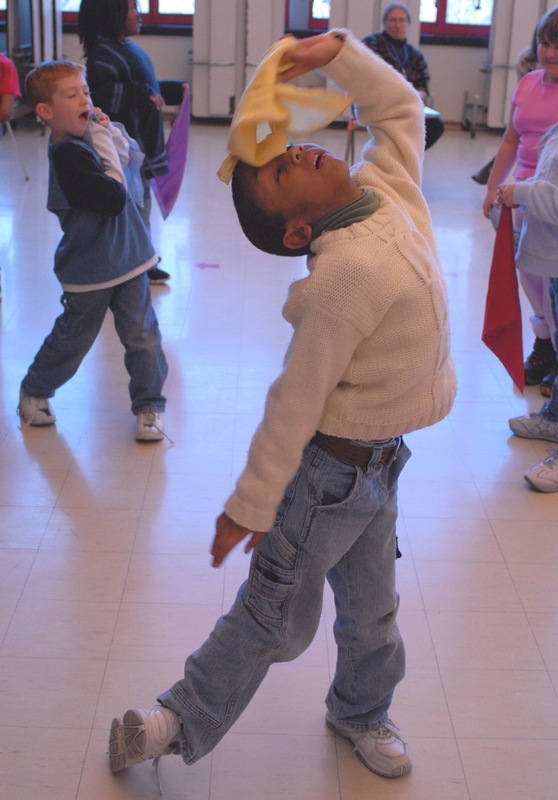 As for school enrichment — which is what I do, teaching curriculum through creative movement and dance — not long ago there was a budget for me to teach ten arts-in-ed sessions with each class. Now, only four. She’s only in the first grade. How can we help her keep that perspective as she climbs the educational ladder? You are so right, keep up the marvelous creative work which is so very needed! Thank you for sharing your wonderful article. Its message needs to spread far and wide. I cheer you and hope to hear more from you. Thanks for your work helping keep movement (kinesthetics) part of K-12 education along with words, numbers, sounds and visualization. If schools include all 5 competencies rather than just linguistic and numerical skills, students will be able to learn faster, better and with more understanding. As part of a complete movement education program, dance helps students learn competencies used to enhance breakthroughs in animation, robotics, game design, ergonomics, prosthetics, physical fitness, physical therapy, gestural communication, movement design and many other ways in which we use movement to learn, think, communicate and create. What you describe is truly 21st century, and yet learning through movement goes back hundreds of thousands of years! It’s an amazing resource, and very inexpensive. What a shame that schools do not take advantage of this natural way to learn. What you are saying makes so much sense. I agree with you 100%. As a teacher in the public schools, I can attest to the fact that there is very little funding for the arts. It’s really a shame. Keep up the good work! Oh Susan, what joy you must feel to see those young children use their bodies for expressing feelings. Now add some materials to build a sculpture of those body gestures or a paint brush to express, through color, sounds of nature or musical notes. All these expressive forms allow young learners to meet the basics with a greater capacity for critical thinking. Keep up your fabulous work. Shame the new custodian isn’t in charge! And the student’s answer – what a great way to begin a residency! Congratulations on your simply beautiful website, Susan. Outstanding insights! Really justifies the need for what we advocate for our children and youth-the opportunity to unleash that which is within. That custodian in right. You are doing something great, every time you teach. Thank you. what a remarkable experience my wife’s girl undergone viewing your webblog. make other individuals easily know certain hard to do matters. also easy tips about the topic to Lizeth.